Today we’re excited to announce a new addition to Brooklyn Tweed’s permanent stable of yarns: an airy Rambouillet laceweight from the softest fleece we’ve ever offered. Vale has been in development since last year and it’s been hard to keep it under our hats! 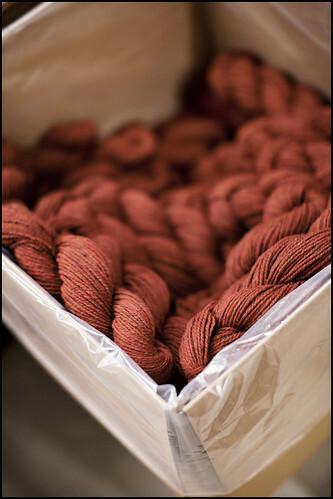 Like all its BT cousins, this breed-specific yarn is 100% American made, from sheep to dyepot. Vale will be available for purchase on May 17. Ready for a sneak peek? Rambouillet sheep are also known as French Merinos; two hundred years of careful breeding developed a fleece with even more crimp and bounce than the merino that’s widely available today. In the United States, Rambouillets are a favorite finewool breed on the western plains. The growers we work with in Wyoming achieve wool with a micron count of 21.5, the softest fiber we’ve used to date. 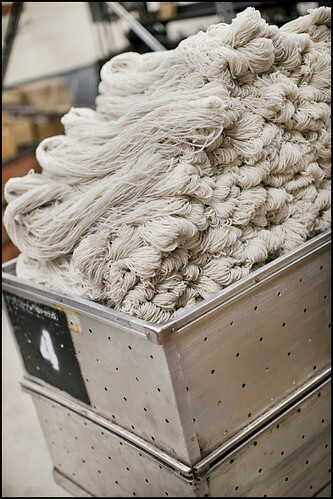 The same partners who help us produce Arbor bring our Rambouillet bales from raw fleece to finished skein. Chargeurs, based in South Carolina, scours it clean and combs it into the smooth and consistent top that’s required for worsted spinning. 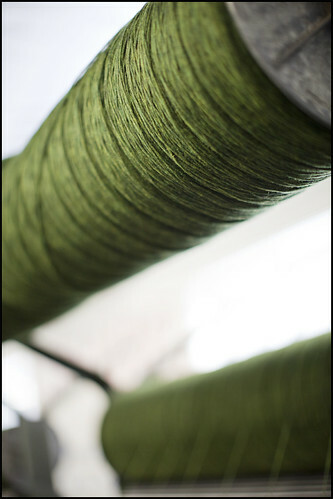 The fiber is shipped on to Maine for worsted spinning at the Jagger Brothers mill, and then travels a short distance to the Saco River Dyehouse for eco-friendly skein dyeing. Vale’s 14 custom shades augment some touchstone colors from the Arbor line with sophisticated softer tones. Dusty rose shades, glacial blues, and lichen yellows form a focused palette that offers both neutrals and brights. We’ve handpicked a selection of favorite lace pieces designed by Jared Flood from the BT archives to re-knit in Vale. (Any guesses which they are?) We love the polished, even spin of this yarn, which shows off stitch motifs to maximum effect. Mull over the palette and the pattern options and get ready to join us for a summer of lace! We’ll be hosting our first-ever knitalong starting in early July and posting our favorite tips and tricks for lace success. If you’re lace-curious but haven’t tried this beautiful form of knitting yet, it will be the perfect opportunity to get your feet wet. Join us this week while we discuss Vale and all of its project possibilities on the BT Ravelry forum. Today we’re taking you behind the scenes to show you where Arbor gets its vibrant color: all aboard the bus for a field trip to Saco River Dyehouse! When we set out to create a new palette of solid colors for Arbor, we felt Saco River Dyehouse in Biddeford, Maine would be the ideal partner for the job. 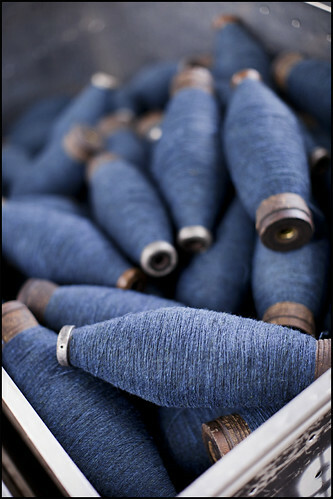 We first worked with them on the colors for Plains, our single-batch Rambouillet laceweight, and the chance to collaborate on a fuller range of colors for Arbor was truly exciting. Apart from their skill at creating beautiful hues, Saco River stands apart in terms of environmental stewardship. This venerable company, which originally operated in Manhattan, changed ownership in 2012 and moved to an historic mill building on the banks of the Saco River in southern Maine. On a mission to bring their old-world craft into alignment with modern technologies and concerns, the dyehouse focused on making its processes organic and environmentally friendly. In 2013 it earned organic certification under the GOTS International Textile Standards, the only yarn-dyeing operation in the United States to have done so. 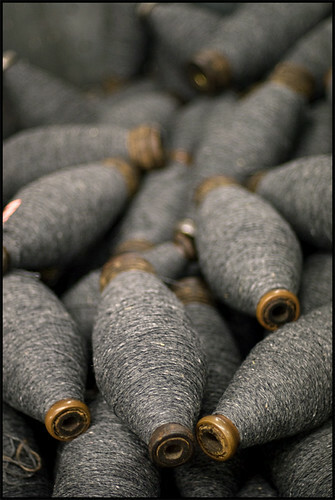 Brooklyn Tweed’s woolen-spun heathered yarns are dyed in the fleece, but Arbor is different. It was spun in its natural sheep’s fleece white and then dyed in the skein. Skein-dyeing is a labor intensive and scientific process. It requires careful handling of the yarn and precise calibration of temperature and water flow to protect the lofty softness of the wool. The dyes must be mixed with perfect accuracy; it takes years of experience to master the chemical recipes that produce various colors and to achieve predictable and repeatable results—blue-greens are notoriously finicky, and even a single grain of pigment more or less can alter the final shade. The temperature must be adjusted over a process of several painstaking hours to develop certain colors or prevent a shift to unwanted overtones. Translating Jared’s vision for the Arbor palette into the final colors required many months of collaboration and test batches, but all that effort was well worth it. 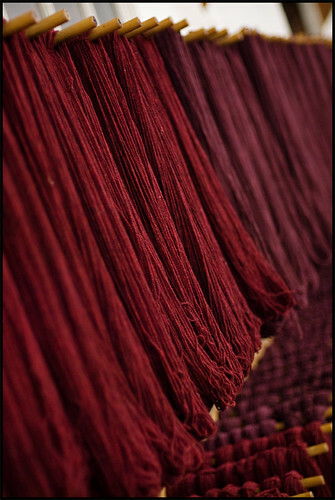 We love the depth and saturation the Saco River dyemasters were able to achieve. We’re excited about our partnership with Saco River Dyehouse and hope you’ll enjoy the many colors they’ve helped us create! 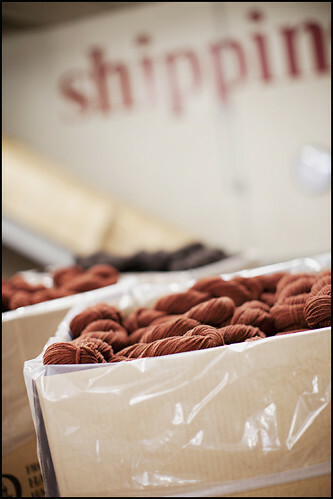 Our yarn has come a long way from its original state as scoured wool. The construction is now complete and only a few finishing touches remain. The yarn must now be removed from the bobbins in 50-gram (140 yard) increments to create individual skeins. The skeining machine (which unfortunately eluded my camera) is set for a certain number of rotations (pre-measured based on that specific yarn’s yards-per-gram ratio) which wind off consistent, exact amounts for each skein. 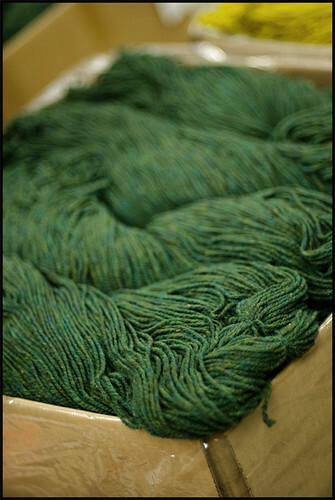 The 50-gram skeins are placed in a plastic lined box and sent along for a final wash. In order to remove residual spinning grease as well as ‘block’ the finished yarn (e.g. brainwash the wool to its new identity), it is important that each skein is washed before it leaves the mill. Equipment-wise, the washing method is no different than running a load at your own home. All finished yarns are gently washed in (packed-to-the-gills) regular-sized domestic washing machines. The difference between a washed and an unwashed skein of milled wool can be rather astounding. In the case of woolen yarns it seems to transform the weight significantly as the fibers relax and fully bloom. After a trip through the washing machine, the skeins are hung evenly along a wall of drying racks. Here they they will sway in front of a brigade of rotating fans which speed drying-time remarkably (I use this same trick at home when wet-blocking garments). The drying wall is enough to make most of us yarn-folk woozy with delight. All that lofty wool swaying gently in the breeze… to say nothing of the sweet, sweet wool fumes wafting through the air. 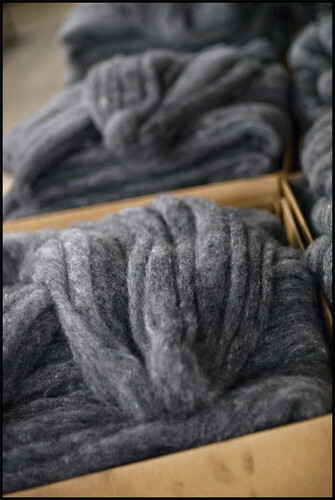 When the wool is completely dry, it is hand-twisted into hank form and whisked off towards the labeling station. Lucy (The Saint) labels each and every skein by hand, making sure each one is properly placed and affixed with an adhesive tag that designates a specific skein’s color name and lot number. When the yarn looks like this, it is ready for its entrance into the Wide World. Each labeled skein is bagged (10 skeins together, organized by color), loaded into freight boxes, and finally shipped to our warehouse in Portland, Maine. The warehouse is one of our team’s nerve-centers: from here we fulfill online orders and ship larger amounts to Flagship stores. Each yarn’s story beyond this point is different, and we hope they bring tactile pleasures to knitting hands wherever they end up. I hope you’ve enjoyed getting a taste of what happens behind the scenes to create and spin Shelter. As I mentioned in my first post, such a magical process deserves to be shared. This experience may even inspire you to seek out a mill and witness this magic in person. In my own experience with mills in both America and Europe, owners and employees are generally very proud of their work and love to share that joy, either through tours or a general eagerness to discuss yarn making. My wish is that we begin to see more US production being done in support of our own mills, before they’re gone. Thanks for joining me! Yesterday we ended with a fresh batch of singles loaded up onto bobbins. 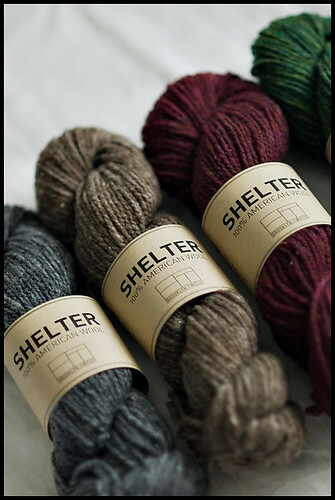 Because Shelter is a 2-ply yarn, the next step obviously involves plying, but before that can happen these babies get a trip to the Wool Sauna. 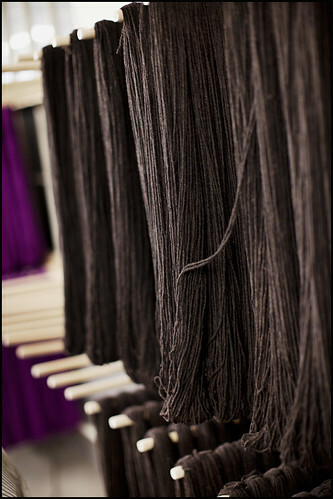 A proper steaming of the yarn in its current form is necessary before plying begins. Steaming saturates the fibers with moisture, causing them to relax and accept their new identity as twisted plies. Before steaming, the (newly given) tension in each ply is fighting to unravel. Much in the same way a good blocking makes everyone’s knitting look better *cough*, the same principle applies here. Wool always behaves better after a bit of moisture sets it straight. 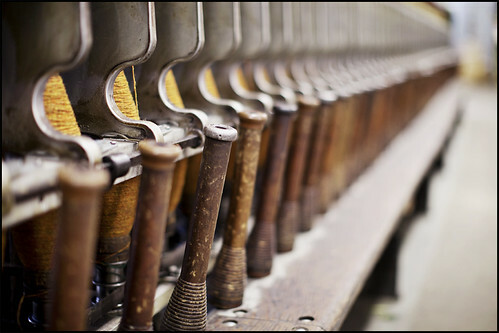 The bobbins are placed in a metal rolling cart that is covered with small holes. These holes are necessary to allow steam to pass through the cart and effectively reach all the bobbins inside. Above you can see one of these “sauna” carts full of finished yarn. While the ‘Fossil’ yarn shown here is a few steps ahead of us at our current stage of the tour, I wanted to give you a good shot of the carts used for steaming. After the wool’s trip through the sauna, the bobbins are ready to be loaded onto the twisting frame (more simply referred to as “the twister” at the mill) and plied into a final 2-ply yarn. The twister functions much in the same way as the spinning frame in that a flyer adds twist (in the opposite direction this time, to balance the direction of twist added by the spinning frame), moving the singles off of their current bobbins, plying them, and winding them onto new ones. When the bobbins on this frame are filled, the yarn has completed the milling process and moves onto the finishing stages — it is now very close to the form you’ll see on your doorstep, or in a yarn shop, but a few more things need to happen to get it ready for the spotlight. It is with these finishing stages that we will conclude our tour tomorrow morning! *The title of this post is a pun on New Hampshire’s state motto “Live Free or Die”, which I read and appreciate every time I cross the border on my way to the mill. We left off yesterday with a rack full of fine strands of roping. Because these ropings currently lack twist, they appear thicker than they will be in the finished yarn. Adding twist to fiber is the key to making yarn — it traps necessary energy and tension into the yarn, increasing strength and (in most cases) elasticity. The amount of twist you add when making single plies of yarn is very important and can take the hand and behavior of the yarn in different directions. Any amount of twist though, be it a lot or a little, is essential for creating knitable yarn. At this point, the ropings pictured above are loaded on to the spinning frame where they will be twisted and wound onto bobbins. 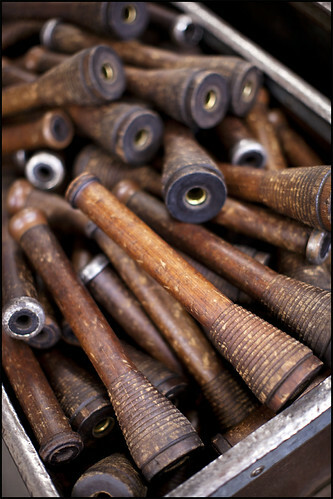 Some of my favorite objects at the mill are the antique wooden spinning bobbins that have been in use for over six decades. They are beautiful objects in their own right. On this trip I was lucky enough to snag one of them as a souvenir, which now resides on the desk in my studio with my small collection of inspirational objects. 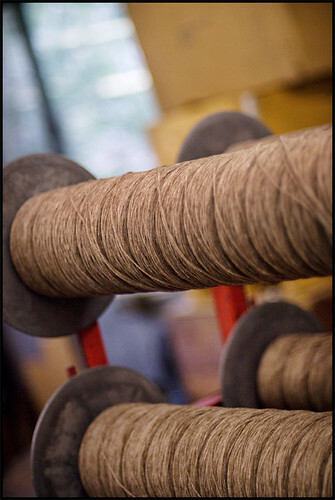 The spinning frame is also responsible for drafting the fiber, which happens just before twisting occurs. When roping is drafted, it is pulled slightly to open up and lengthen the fiber structure before the single plies are “committed” through twist. The amount of drafting can be increased or decreased at this stage and is also a player in the finished behavior of the yarn. After the fibers are drafted, a flyer spins and concurrently winds them onto a bobbin. 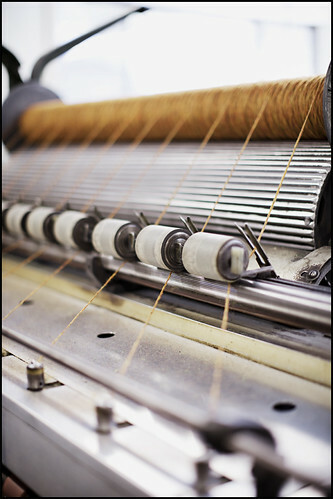 On this machine, the fiber starts on racks high above the machine and works its way down towards the floor, where fully loaded bobbins are collected and shuttled off to the next work station. A fresh batch of bobbins is a thing of beauty. When all the bobbins are collected into a rolling cart, they are ready to move onto the steamer, which is where we will begin tomorrow. Until then though, a beautiful batch of grey wool! I started yesterday by telling you about one of the two aspects that affects Shelter’s milling process: fleece dying and color blending. 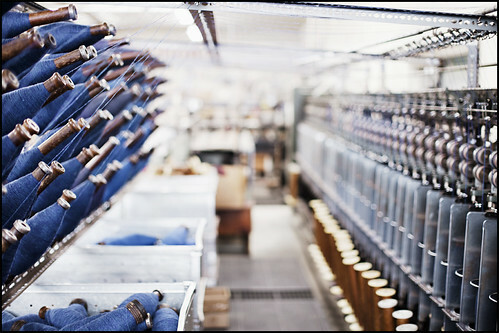 The second quality that significantly affects the process is its preparation as a woolen-spun yarn. 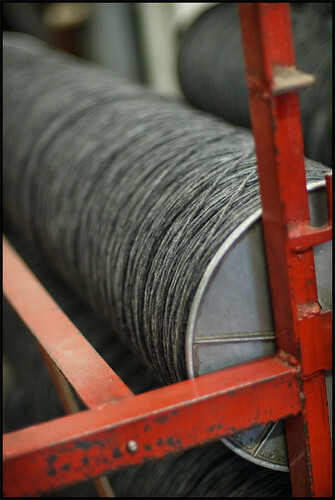 Woolen-spun yarns, unlike their smoother worsted-spun cousins, are prepared using a process called carding. 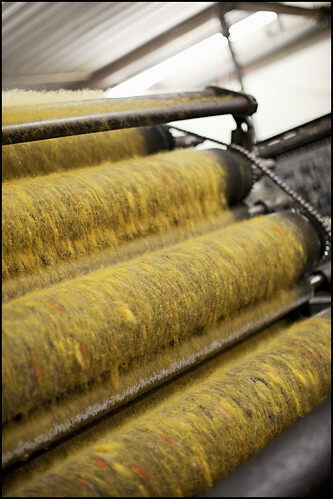 We left off in our last post with a mish mash of loud-colored wool going into the Picker. Once the Picker has done its work, the wool gets loaded onto the Carder: a giant machine with several rolling cylinders covered in metal teeth. The purpose of this machine is to open up the fiber, blend the wool together evenly, and prepare it into individual plies of roping which will be later spun into yarn. You’ll notice right away that the carder has already whipped our bright wool confetti into shape, producing an even, golden heather. 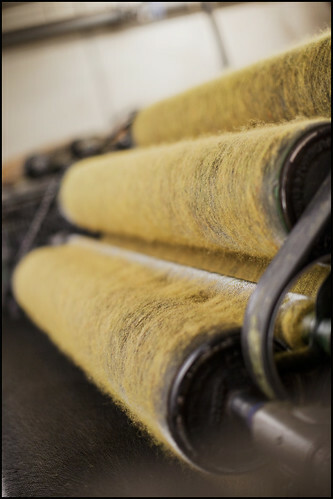 Unlike combing, which occurs during worsted-spinning, carding allows large amounts of air to be trapped within a cloud of slightly jumbled fibers. 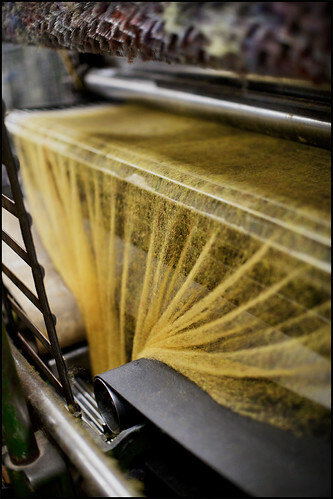 These tumbleweed-like layers of wool allow for a loftiness and springiness that will translate into the behavior of the finished yarn. The carded fiber emerges as a ‘web’ halfway through its carding process; the wool at this stage looks incredibly beautiful and delicate, like a gentle veil of color floating through space. If the fiber was being prepared for handspinning, it could be taken off the machines at this stage in batting form. Below is a box of freshly carded grey fiber that wasn’t spun beyond this point. If you could reach your hand in here, you’d be amazed at how soft and fluffy this stuff feels. You might want to set up camp inside of this box. As the fiber approaches the end of the carding machine, a large cylinder called the doffer is used to relay the bat into the final section of the machine, where it is split into several individual ropings (the term “roping” is specifically used to describe this stage in woolen spinning mills, versus the more commonly known term “roving” which is used in a worsted spinning processes.) These fine strands of roping will make up a single ply in every spun yarn, but as yet have no twist in them. If you’ve ever knit with an unspun icelandic yarn before, the plies at this point have a similar appearance. The unspun roping strands mark the conclusion of the carding process. When a batch of roping cakes are ready, they are removed from the Carder and stored on racks (shown here) where they await the next step of the process: the spinning frame. It is there they will get their first taste of true twist. Tomorrow, we’ll make some plies.